“The Book of a Savior”, the documental project of the FotoDepartament Gallery photographer Jana Romanova, was published at the news portal Lenta.ru. “The Book of a Savior” is the result of a three-year working and of the hundreds accidents, which she saw with the rescue officers. Prototype of the project – the book of a savior – is a document, which should be filled in during the whole rescue officers’ career: every single call is inserted into it, and the book is permanently growing with such notes as “dangerous tree”, “dead body”, “road accident”. Every shift they meet death face to face as the real soldiers during a war. Jana Romanova, after three years of observations, made her own “The Book of a Savior” with some stories about who they are and why much of them never quit their job. 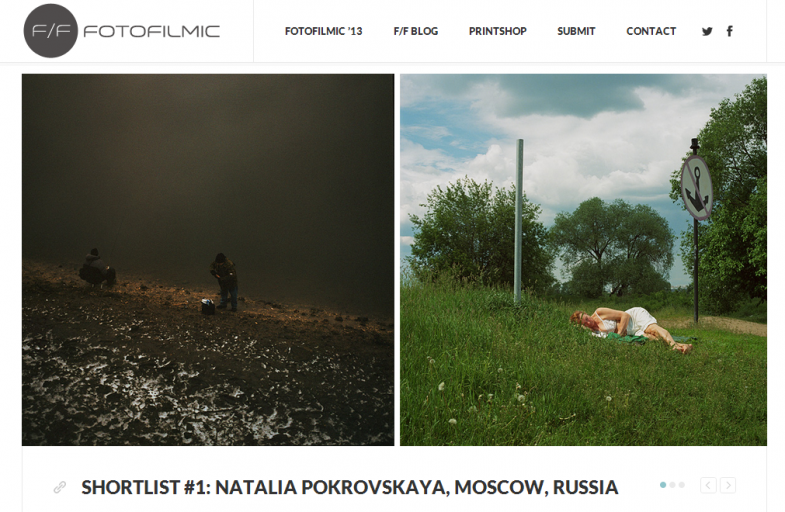 Natalya Pokrovskaya, the participant of the educational program “Photography as a research”, was included into the short-list of the international film photography contest Fotofilmic 2013. 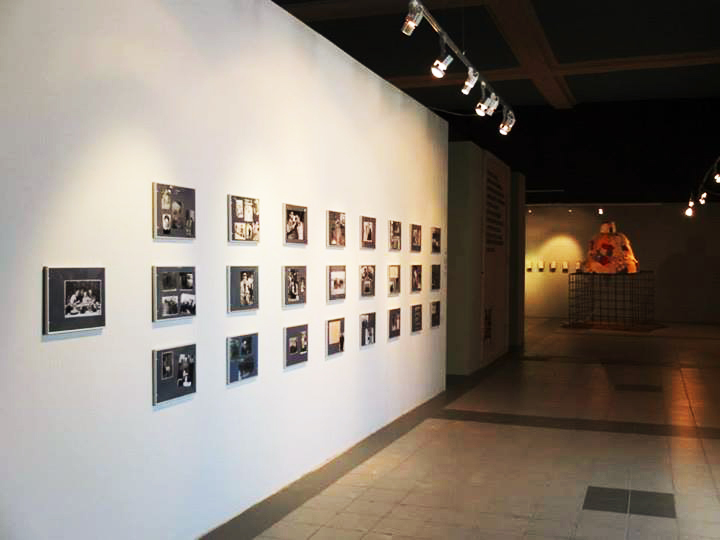 Her works were exhibited during the final show in the Positive Negative Gallery, Vancouver, Canada. The main aim of Fotofilmic is to demonstrate a new understanding of film photography in the context of contemporary art and contemporary photography art practices. Tatiana Vinogradova’s project “Outburst of the first episode”, which recently has been a part of the exhibition “Young Photography 2013 1/2. To see”, was published into on-line journal Colta.ru. The characters of this series are the patients of Caschenko psychiatric hospital, of a male department of the first episode. Most of them are 18-25 years old and suffer from schizophrenia less than 5 years. This project is an attempt to find out if “strangeness” really exists, how can we catch it and can we do it in general? It is possible, that we just can’t accept something we don’t have in our experience. Young, but already remarked by the critics, German journal Teller published a work of Tatyana Palyga, the FotoDepartament gallery photographer and the participant of the exhibition “Young photography 2010 2/2. Time”. Journal Teller is about stories, told using texts, pictures or photos. That’s why Tatyana Palyga’s project “Colorless days” became a part of a new issue. It is a story about working days in a usual office, about different things, which bring into it some sheen of joy. Books: Alexander Veryovkin, Nick Degtyarev, Tatyana Palyga. International contest of professional and amateur photography “Fotomania 2013” was another part of the Baltic biannual exhibition of photography in Kaliningrad. 91 participants from 27 countries of the world were selected by the jury for the second round. Only 10 projects received main prizes of the contest. 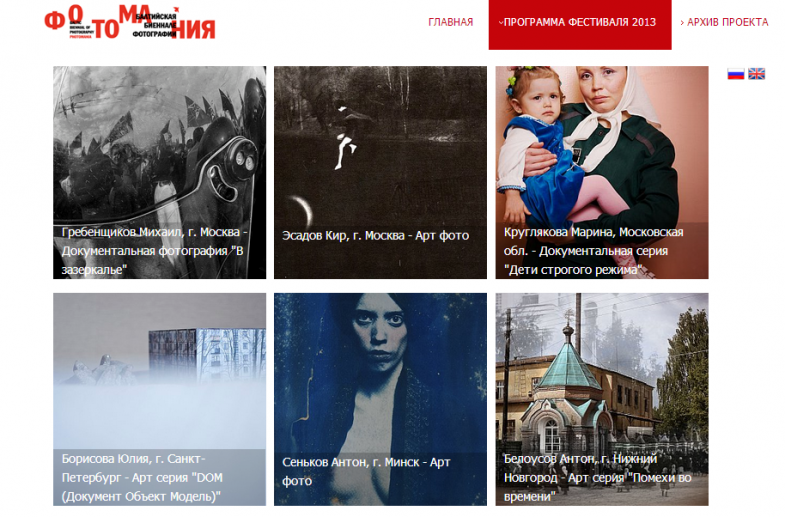 There are three FotoDepartament gallery photographers and participants of our educational programs in this list: Kir Esadov, Julia Borisova and Anastasia Bogomolova. 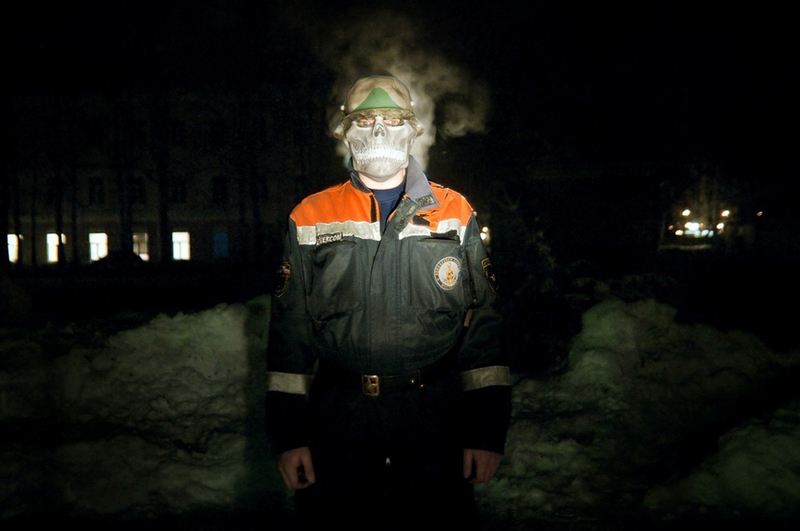 Kir Esadov received a grand prize of “Fotomania 2013” in the category “art-photography” with his pictures from series “The Private Diary of the Nerd”. 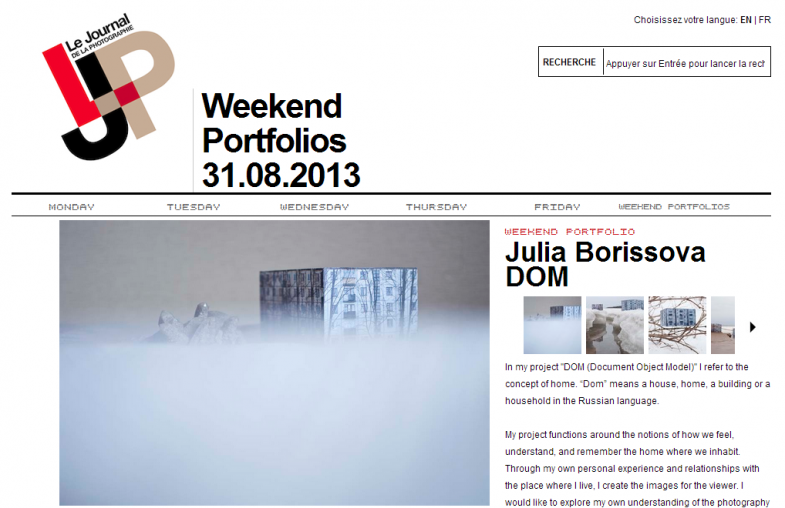 Julia Borisova, who not so long ago became a FotoDepartament gallery photographer, won a first place with her series “Dom”. It’s an analyses of a concept “home” and its transformations. Anastasia Bogomolova, the participant of educational program “Photography as a research”, won the first prize in category “Monochrome photography” with her series “Recall”. Her project is based on her family photo archive. Anastasia’s project participated in the contest as a group of several images, the whole project could be seen on the exhibition “Young Photography”. Julia Borisova, the FotoDepartament Gallery photographer, with her series “DOM” continues to become a winner in contests and a hero of publications in core editions. Besides getting the first place in contest “Fotomania 2013”, this series was published in French on-line photography journal Le Journal de la Photographie. The series “Dom” is an analyses of a “home” concept and its transformation during the time it became “Khruschyovka”, in different conditions of theatrical or historical reality. Another hero of publication in Le Journal de la Photographie became Alla Mirovskaya with the project Espace Quelconque, which was done during the educational program of FotoDepartament «Photography as a research». Photography became here for the author an instrument for searching fundament for self-identification. In the series of questions like «who I am», «what do I like» there appeared an understanding, that classical photography is not enough. That is why some shots from Antonioni’s film «The Passenger» became a part of this project: they didn’t fill all the blind spots, but put a new dimension into the photographs. Alla Mirovskaya writes, that is not necessary to be familiar with the movie for understanding her project. The movie shots, combined with the authors pictures, create some new, full story. Certain photos from Anastasia Bogomolova’s project “Datcha / Garden”, created during the workshop of Dutch photographer Anouk Kruithof and the program “Photography as a research”, became a part of on-line exhibition “Botanicals”. “Botanicals” is a project of American The Kiernan Gallery, dedicated to different interpretations of flora in photography. 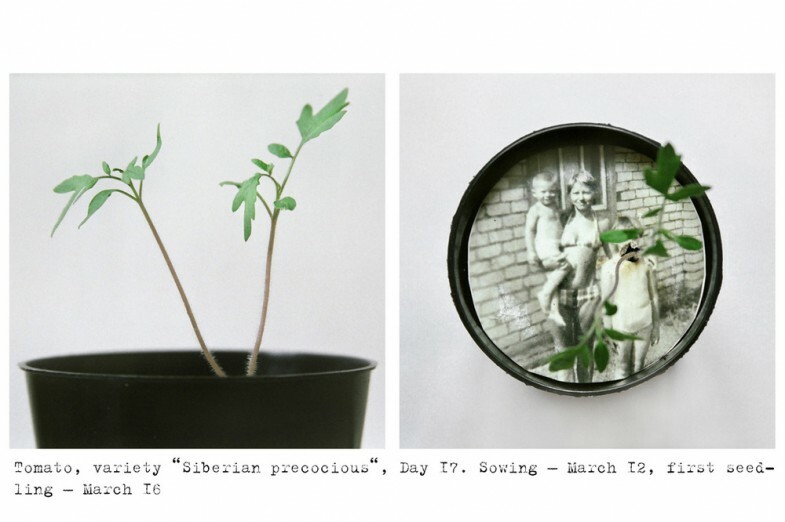 In her series “Datcha / garden” Anastasia Bogomolova was watching how flowers and vegitables were growing through the old family photos, how something alive was going through something nonliving. 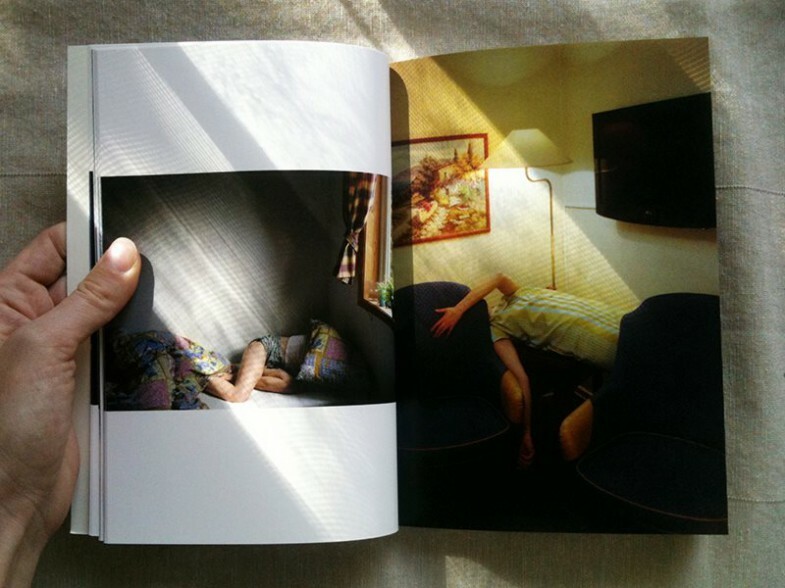 Natalya Reznik’s project “Looking for my father” was published in several issues this month. 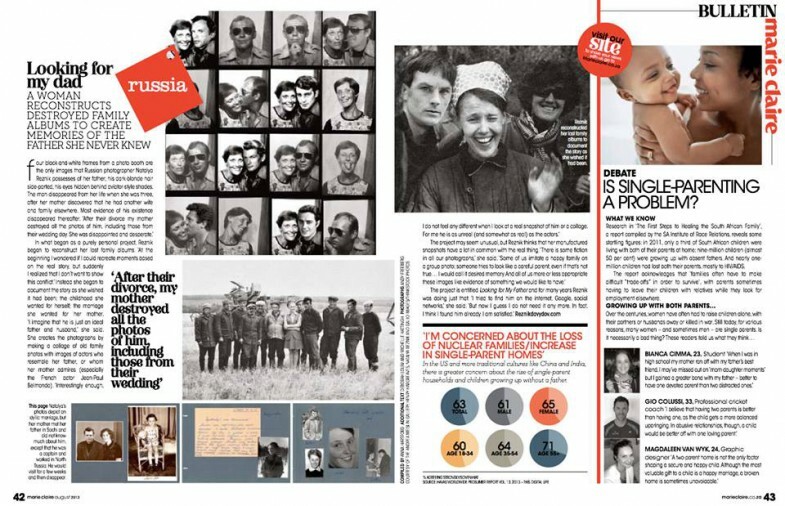 It was featured even in journal for women Marie Claire: touching story about searching father offended not only the specialists. “Looking for my father” as an object of contemporary art participated in exhibition “Art versus geography” in Perm museum of contemporary art. 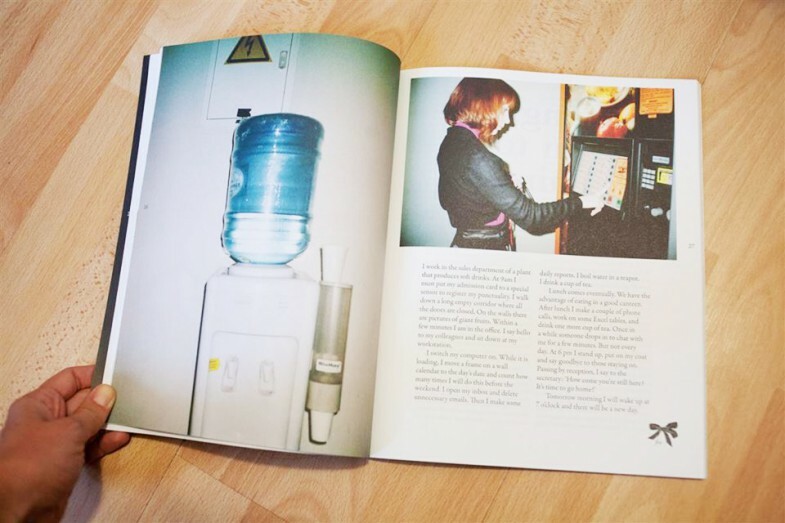 The book project “Doorways” of Elena Kholkina, the participant of the workshop of Dutch photographer Anouk Kruithof, entered the short-list of “Unseen Dummy Award 2013”, photo book contest. The contest is held during the large-scale “Unseen Photo Fair”, which will take place in Amsterdam, from 26 to 29 of September, 2013. Its main prize is a publication of the winner book by one of the most prestigious publishing houses, a kind of a key into international photography industry.